TOKYO – Almost everyone stood when the bride walked down the aisle in her white gown, but not the wedding conductor, because she was bolted to her chair. The nuptials at this ceremony were led by “I-Fairy,” a 4-foot (1.5-meter) tall seated robot with flashing eyes and plastic pigtails. 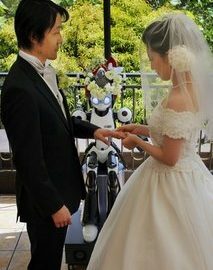 Sunday’s wedding was the first time a marriage had been led by a robot, according to manufacturer Kokoro Co. The wedding took place at a restaurant in Hibiya Park in central Tokyo, where the I-Fairy wore a wreath of flowers and directed a rooftop ceremony. Wires led out from beneath it to a black curtain a few feet (meters) away, where a man crouched and clicked commands into a computer. Japanhas one of the most advanced robotics industries in the world, with the government actively supporting the field for future growth. Industrial models in factories are now standard, but recently Japanese companies are making a push to inject robots into everyday life. Honda makes a walking child-shaped robot, and other firms have developed them to entertain the elderly or play baseball. Kokoro, whose corporate goal is to “touch the hearts of the people,” also makes giant dinosaur robots for exhibitions and lifelike android models that can smile and laugh. The company is a subsidiary of Sanrio Co., which owns the rights to Hello Kitty and other Japanese characters. “This was a lot of fun. I think that Japanese have a strong sense that robots are our friends. Those in the robot industry mostly understand this, but people mainly want robots near them that serve some purpose,” said bride Satoko Inoue, 36, who works at manufacturer Kokoro. “It would be nice if the robot was a bit more clever, but she is very good at expressing herself,” said new husband Tomohiro Shibata, 42, a professor of robotics at the Nara Institute of Science and Technology in central Japan.